Hobie Forums • View topic - We have two great new accessories for Hobie Islands! We have two great new accessories for Hobie Islands! Post subject: We have two great new accessories for Hobie Islands! Achieve the most performance and optimal course. Up on the mast head is the least disturbed wind flow, so the optimal location for a wind direction vane. As the wind changes direction or oscillates, you need to adjust heading and or sail trim for best performance. 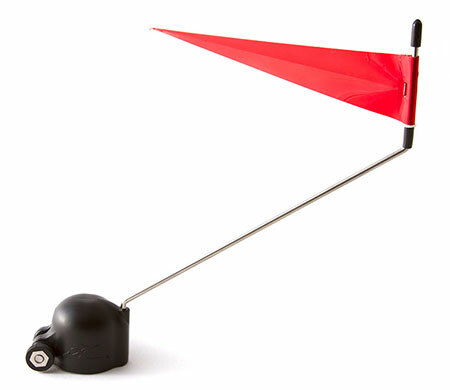 This wind vane is designed for all Hobie Islands when not using a spinnaker kit. Simply slips over the mast head and tightens in place with a thumb screw. Add performance sailing when reaching or running. 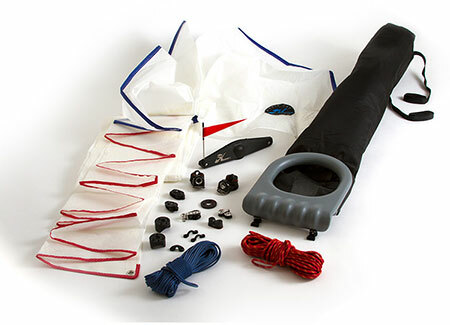 The Hobie Island spinnaker kit includes a snuffer launching and retrieving bag which makes handling the spinnaker as easy as can be. Simply pull on the halyard line to launch, set the sheet and off you go! To lower, ease off the halyard and pull on the retrieval line. The spinnaker drops and stows directly into the snuffer system. The kit includes a mast head wind direction vane for use while rigged for the spinnaker. Note: Spinnakers can be challenging to rig / sail and may not be for the novice sailor. Consumers are advised to rig, test on land then learn to sail the spinnaker in light winds. We will begin shipping Island Spinnaker kits late next week! Post subject: Re: We have two great new accessories for Hobie Islands! Awesome!!! Heading to my dealer today!!! Great News. My dealer and I are all over it. Thank you Matt, and the rest of the Hobie team. These 2 additions look awesome! Captain of the LIC. Landlocked Island Club, Omaha Ne. Who will be the one to post the first video? Looking forward! Is it already in Europe? Any idea if the instructonal video incluse a guide to telling one's wife about the new reacher? "You spent how much on WHAT?!?! It already has a sail!" Question - I understand why certain parts and pieces have to be different between the AI and TI, but is the sail itself the same size, shape, etc.? Tom from the user guide it looks like the TI's is larger. There are three grommets that the snuffer line runs through as opposed to only 2 on the AI's. Which it is the spinnaker sail area?? bar you need the tapped holes next to the other two Harken Cam Cleats, and this is only on the new island. To adapt the Harken Cam Cletas on the old boats we need to do a modification. I'm sure Hobie will explain the differences, eventually. At the last EC I sat and chatted with Jim for quite a while and he showed me the spin kits and we went thru them in detail. The sail material is similar to the material used on the screacher on your WETA (don't know what it's called, but I love that stuff). I'm assuming the kit has not changed a lot since then. The kit is really well thought out and well designed (IMO). The Adventure version looked to be an assymetric spinnaker (not a code zero screacher type), it looked to be around 60 sq ft on the adventure version and around 80 sq ft on the TI version (just rough guesses on my part). My main concern seeing the design, and initially having the same issue with my spins early on. I told him if he doesn't shorten the battens on his main and tape over them there is a huge potential for the rear stay line to get wrapped around the batten posts on the main. If this happens your kind of screwed (especially in high wind). If that happens you can't furl the main, or bring the spin down (better have a big anchor and a knife at that point (lol). If you furl the main in a few turns whenever the spin is out this becomes a non issue, or you can do like I did and run that rear stay line inside a piece of 3/8 pvc water pipe (the pvc prevents the stay line from getting tangled). The only additional pointer I have is when using the spinnaker (especially in high winds) it's a pretty good idea to keep tension on the main control line to prevent the mast from bending too far forward. The problem is that little 1/4 inch stud at the base of the mast holder, too much forward force breaks that stud (I've broke quite a few). The other problem that creeps up if you allow the mast to bend too far forward is the normal lifting force from the spin becomes downward force and the boat will dive and pitchpole when you go over big boat wakes or rough offshore chop, I've pitch poled mine 4 times now (you go from 20 mph to zero in one second flat, the boat doesn't flip like a cat would, the bow just dives down about 3-4 ft), bring along plenty of AKA sheer bolts. I'm sure everyone will figure all this stuff out for themselves via hard knocks, just thought I would share some of my trials and tribulations of using spins on TI's over the last 5-6 yrs. I still contend there is nothing more fun in sailing than launching a giant spinnaker and watching it fill with air (it's like a super charger), hang on to your hats folks, let the fun commence.... Just don't allow it to pop open too fast in heavy air, you will snap your mast. Be careful of gusting winds too. I bent the mast on my Young 7.8 water ballast with a traveller that shouldn't have been up. 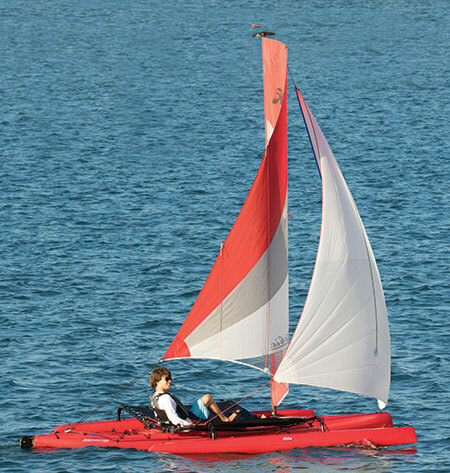 Hope Hobie Australia get at least one for me in their next shipment.